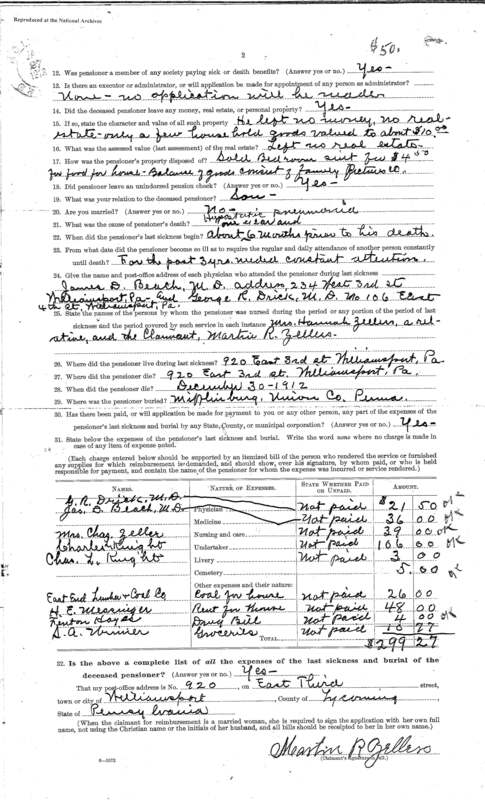 I received the Pension Records for Henry Angle, one of my wife's great-great-great-grandfathers, who also fought in the Civil War. He is in the same part of the family tree as the Zellers. 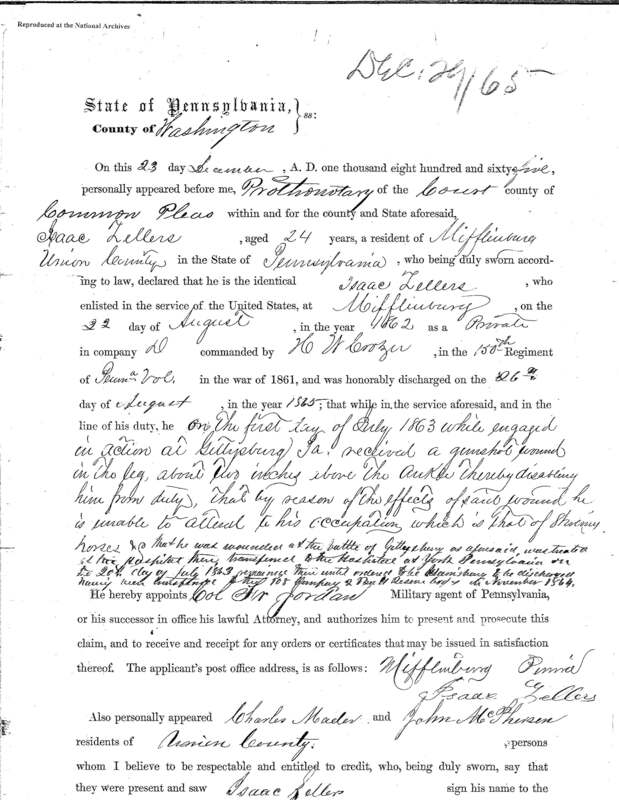 While it doesn't note his parents' names, it does list his children and their birthdates, and it also notes the location of his marriage and birth, in Mifflinville, Columbia County, Pennsylvania. I'm writing the Columbia County Historical Society to see if anyone could possible search the recrods that they have. 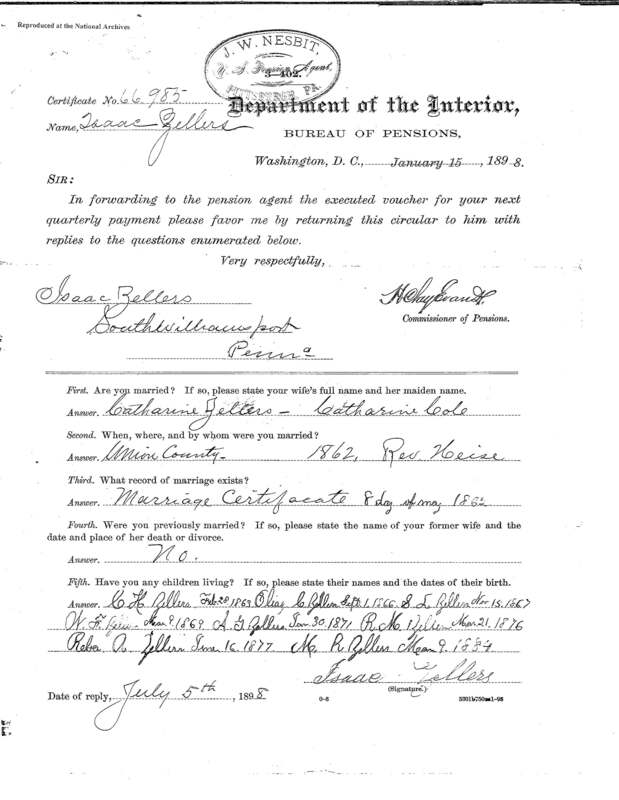 A death certificate arrived for my wife's great-great-great-grandmother, Emma Catherine (Cole) Zellers. 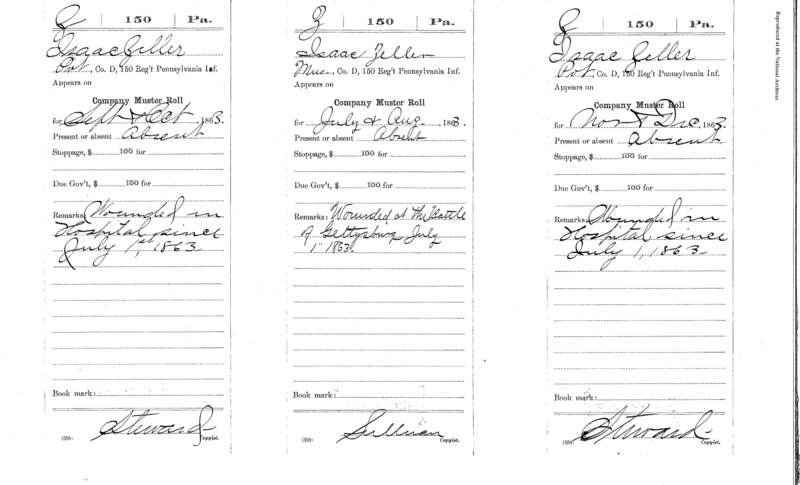 She was married to Isaac Zellers. She was born about March 1842 and died 20 January 1897. 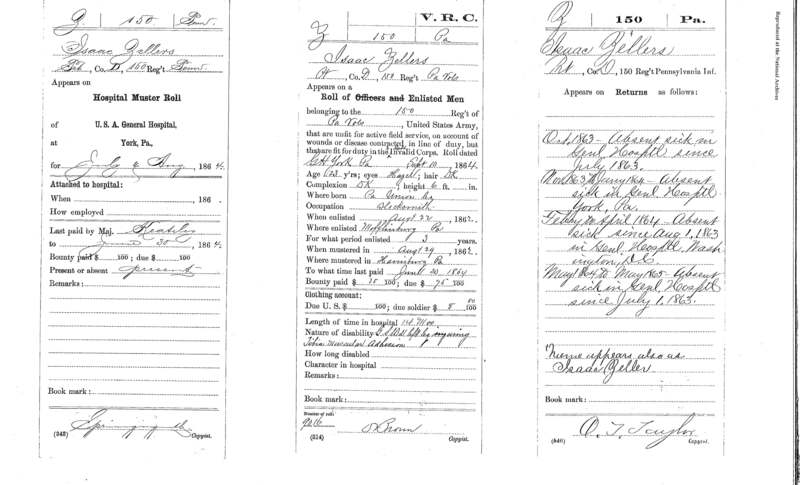 Isaac Zellers, my wife's great-great-great-grandfather, served in the 150th and was injured during the Battle of Gettysburg. He spent the rest of the war in the hospital.
"" Up to this time," says Major Chamberlin, " our colors were safe. The Color Sergeant had been killed in the orchard, and all the color guard had been killed or wounded, except one, some of them receiving three or four balls. The colors were held by Corporal Gutelius, of company D, who carried them to the town, and insisted on keeping them, although he was slightly wounded. Stopping a moment to rest, the rebels were on him, and he was shot dead with the colors clasped in his arms. This is the same flag which was presented to Jefferson Davis, with a flourish of trumpets, at the request of a North Carolina Lieutenant, who, it was alleged, with a handful of sharp-shooters, scattered a Pennsylvania regiment, and captured their colors; but in doing so, was himself mortally wounded. The flag was found with Jefferson Davis' effects, when he was overhauled in Georgia, in the spring of 1865. "This flag was held by the Secretary of War, until October 25th, 1869, when it was transmitted to the Adjutant General of this State, with a letter, in which he says " I am directed by the President to send herewith, the flag of the One Hundred and Fiftieth Pennsylvania Volunteers, said to have been captured at Gettysburg, and re-captured in the baggage of Jeff. Davis." 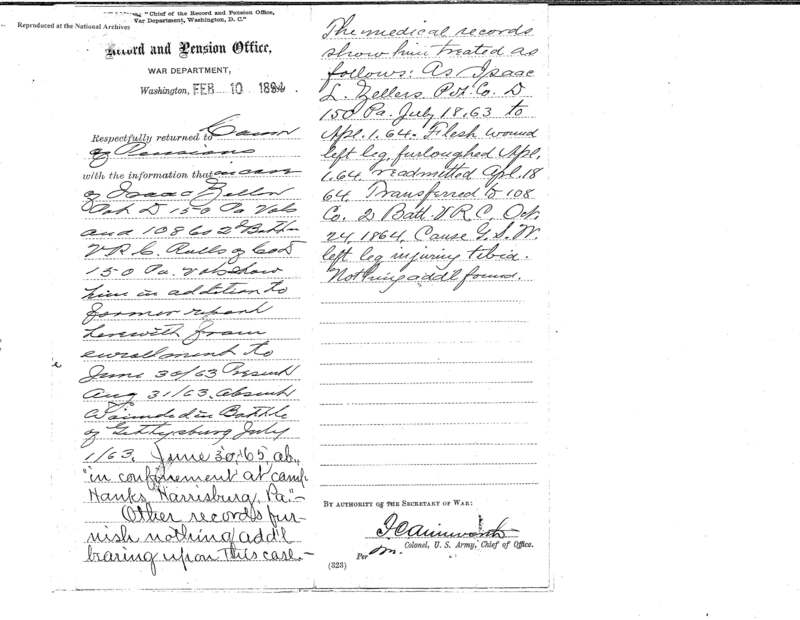 Another one of my wife's great-great-great-grandparents, Isaac Zellers (1840-1912), also fought in the Civil War. He was in Company D of the 150th Pennsylvania Volunteers. After mustering near Harrisonburg in 1862, they were guard troops for President Lincoln, fought at Chancellorsville and Gettysburg. Isaac Zellers was injured at Gettysburg and spent the rest of the war in the hospital. 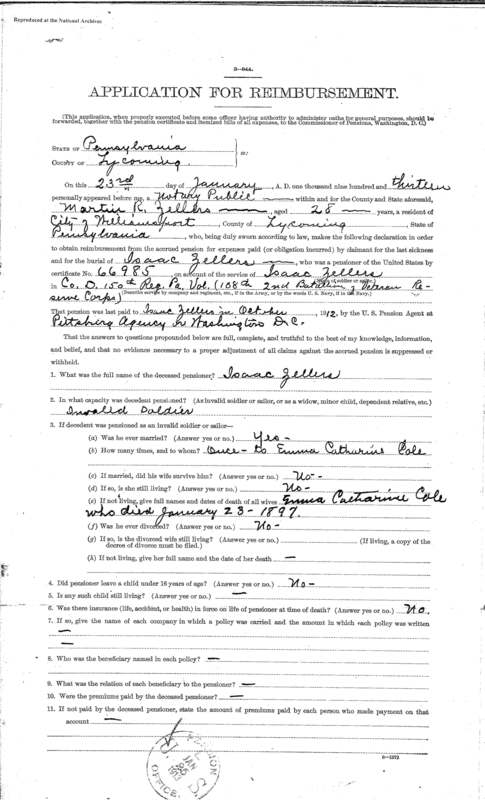 It says "Name appears also as Isaac Zeller"